In 8-inch skillet, melt butter over medium-low heat; add bread crumbs. Cook and stir 3 to 5 minutes or until toasted. Pour into small bowl; stir in 1 tablespoon Parmesan cheese. Set aside. Cut eggs lengthwise in half. Slip out yolks into medium bowl, and mash with fork. Stir in mayonnaise, the remaining Parmesan cheese, garlic, Worcestershire sauce, lemon juice, pepper and salt. Fill whites with egg yolk mixture, heaping it lightly. Sprinkle bread crumb mixture over eggs. Cover and refrigerate until ready to serve. 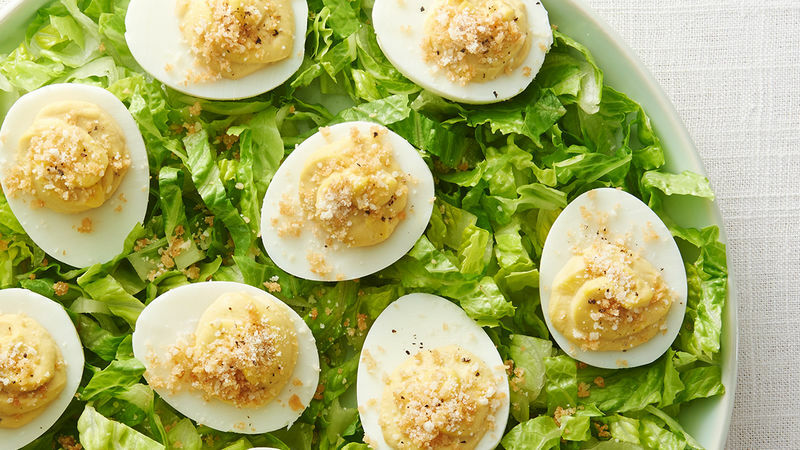 Spread romaine evenly on large platter; place eggs on top. Sprinkle eggs with bread crumb mixture immediately after filling so bread crumb mixture easily adheres to the filling. For easy filling, spoon egg yolk mixture into 1-quart resealable food-storage plastic bag; clip 1/2 inch from corner of bag, and pipe filling into halved eggs.